As a passionate photographer and preservationist, I’m always on the lookout for fascinating buildings, from the funky to the sublime. 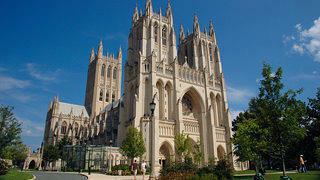 Washington National Cathedral, winner of the 2013 Partners in Preservation contest and also one of our National Treasures, is definitely the latter. From the light streaming through stained glass windows and bathing the interior in a rainbow glow to the fantastical creatures that adorn the outside, National Cathedral is a photographer’s dream. Every time I visit I discover something new. And no wonder: There are 112 gargoyles, the last completed in 1987, and more than 3,000 grotesques and other architectural carvings. 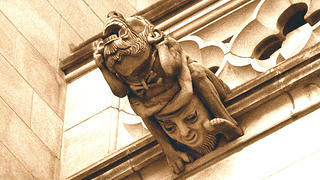 A gargoyle is also described as a grotesque, but while all gargoyles are grotesques, not all grotesques are gargoyles. 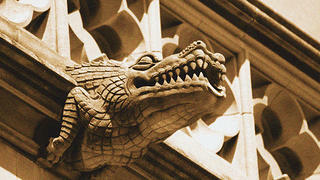 Grotesques include all fantastical creatures, whether they have drain pipes or not. One of 13 dragon gargoyles, Sleek Dragon is a winged, clawed beast with distinct scales on the face and wings, and with large pointed teeth. 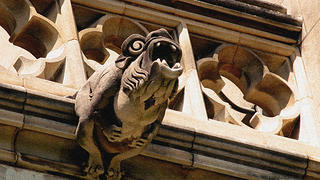 Many of the gargoyles were funded by individual donors as gifts for family members. "Bishop" was the nickname of the donor's husband who was editor and publisher of a religious newsletter. The humorous carving is wearing a stole with a large bell hanging from one hand and an inkwell and quill in his pocket. The donor for this gargoyle wanted the "ugliest monster in the world." The artist designed a four-armed, bearded humanoid creature sitting on top of a human head to represent the good and the evil in man. 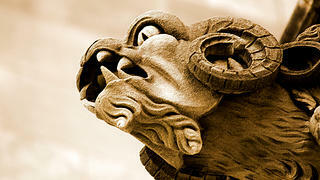 With large, spiraling horns and pointed teeth, this beast symbolizes the menace and strength of the ram, critical characteristics for a gargoyle meant to ward off evil. This grotesque (note the lack of a drainpipe) was created as a joke, depicting the Cathedral's dean looking on in shock as a stone carver whistled at young women passing below. 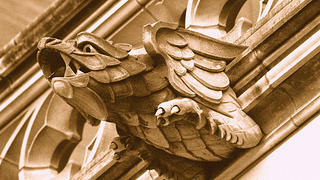 As gargoyles evolved over the centuries, they became more complex and complete, with legs and claws that grasped the wall and heads that projected outward, similar to the National Cathedral's alligator with its huge jaw and sharp teeth. Two retired medical professors with no formal sculpture training designed American Rattlesnake. 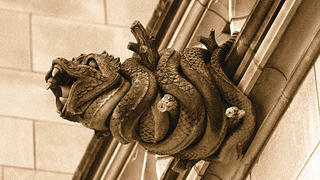 Desiring something that would symbolize the fact that the Washington National Cathedral is an American house of worship, they modeled their gargoyle after the "Don't Tread on Me" snake. 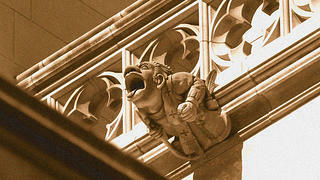 Hands clutching its stomach and mouth open in a howl of distress, Bellyache illustrates the evolution of gargoyles. 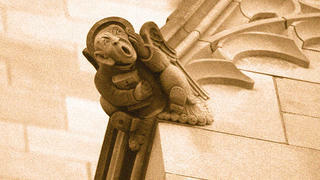 By the 15th century, they had become more amusing than menacing, a trend reflected in many of the National Cathedral's gargoyles.